Architect's rendering of Wilshire Grand project proposed for downtown L.A. If the city planning department gets its way, the tallest building on the West Coast will not be wrapped for much of its 65-story height in electronic advertising signs. Citing concerns raised about light pollution and traffic safety on the nearby 110 Freeway, city planners want the yet-to-be built Wilshire Grand project to be free of any signage other than building identification above 150 ft., or approximately 12 stories. Many anti-blight advocates and others were alarmed when details of a sign district proposed for the billion-dollar hotel and retail project were made public this past summer. Developers were proposing almost 250,000 sq. ft. of signage, including digital signs, full motion video signs, and electronic advertising displays embedded in the walls of the 65-story tower and its 45-story companion. Because the project on Wilshire Blvd. is just south of the 110 freeway, the signage would have been clearly visible to motorists traveling that roadway in both directions, and questions were immediately raised about their potential distraction to those motorists and negative impact on traffic safety. Concerns were also voiced about light pollution, visual blight, and excessive energy use. According to a report issued last week by the planning department, a series of proposed signage restrictions adequately address those concerns. For example, no electronic signage would be allowed above 35 ft. on any building facade directly facing the freeway. Restrictions are also proposed on the level of illumination and hours of operation of the signage on other facades, to mitigate possible disturbance to occupants of apartments and condominiums in the vicinity. For entire report, click here. The report also recommends that no signage be allowed beyond the amount all commercial buildings are entitled by city ordinance unless existing billboards in the area are removed at a ratio of one square foot of billboard to each two square feet of proposed signage. Electronic signage integrated into the buildings’ walls would be allowed at a ratio of one square foot of billboard taken down to each three square feet of signage. Because the one-block project site is now entirely occupied by the existing Wilshire Grand Hotel, developers of the new project would have to acquire existing billboards elsewhere in order to remove them and meet the takedown requirement. One major issue left unresolved by the report is that of off-site signage, which is banned citywide but can be allowed in sign districts, a fact that has been at the center of a number of lawsuits by sign companies seeking to overturn the ban. According to the report, any regulations pertaining to off-site advertising will be developed after future review by the City Attorney’s office. The report does not address the logical question of why the City Planning Commission is being asked to approve the project, including the sign district, before legal advice has been rendered by the City Attorney on a very important element that could affect the city’s ability to regulate signage in other areas. The environmental impact report for the project identified off-site advertising as part of the signage, but didn’t specify the amount of where it would be located. Another issue likely to arise at the planning commission is the fact that the proposed sign district doesn’t meet the requirements set forth in a revised sign ordinance approved by the commission last year. That ordinance sets a minimum size for sign districts of 5,000 ft. of street frontage, which is far greater than the approximate 1,500 ft. on the Wilshire Grand project area, although the revised ordinance hasn’t yet been take up by the city council. In its discussion of sign districts, commissioners expressed a desire to avoid “one-project” sign districts and to require findings that a proposed sign district would encompass an entire neighborhood or area with common characteristics. 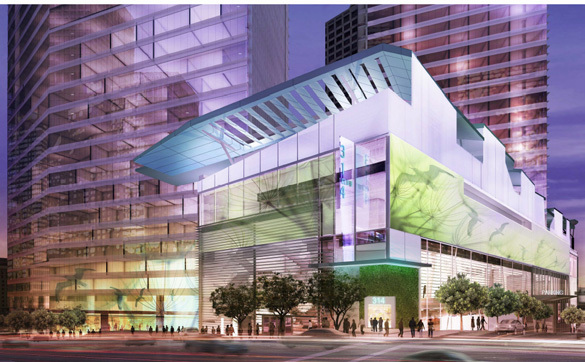 For earlier articles on the Wilshire Grand project, click here.